They love us and they trust us completely. Utterly devoted, they comfort us and provide unconditional love. Whether noble, adventurous or just plain adorable, our dogs are family. Feed them abundant nutrition for life. Feed them Life's Abundance Dog Food! It's fuel for their soul and formulated for all life stages. Life's Abundance Dog Food | Save 20%. Dogs of all ages enjoy health, wellness and vitality in every bowl. Delivered super fresh to your door. ​Life's Abundance Dog Food provides your best furry friend with a superior nutritional edge. Its prepared and formulated with love to provide the best possible nutrition available. This amazing premium health food for puppies and adult dogs is made only with select ingredients, to help your dog achieve and maintain optimal health. The natural flavored kibble is loved by both puppies and adult dogs of all breeds and sizes. Every ingredient in Life's Abundance is carefully selected to promote the most healthy effects on a dog's physiology. The delicious recipe features a diverse array of high-quality proteins to help puppies grow strong and adults maintain health and muscle mass. Unlike many competing formulas, Life's Abundance Dog Food contains guaranteed amounts of several beneficial ingredients including vitamins A, C and E to supply dogs with antioxidants throughout their life cycle. It provides a harmonious balance of omega-3 and omega-6 fatty acids to promote healthy skin and a glossy coat. Probiotics are added to help aid a healthy digestion system. A balanced blend of calcium and phosphorous has been added to promote healthy bones. Dietary fiber is added to help promote healthy digestive health. Furthermore, this impressive formula includes a generous selection of vegetables and fruits for their unique health-promoting properties. This tasty formula does not, and never will, contain artificial colors or flavors. It does not contain, corn or corn gluten, wheat or wheat gluten. Their are no added chemical preservatives either. When you feed Life's Abundance Dog food you'll understand why thousands of people say it's what dog food should be! If this is the first time that you've heard about this wholesome food, learn more by watching the video below. The best kept secret in the world of pet products will be revealed. Isn't it time that your precious canine starts living abundantly today? Dr. Buddy says, "Dogs Thrive on Life's Abundance Dog Food!" There's always something new to learn at Dog-Food-Store.com. February 1, 2019. Looking for a nutritious training treat that is not filled with chemicals that you wouldn't normally feed your dog? Learn more about Tasty Rewards Training Treats. January 10, 2019 - Grain Free Turkey and Berry Chewies. Dr. Buddy is very sure that your dog will love the mouth-watering, grain-free recipe that features free range turkey, pumpkin and 3 berries. These chewies are the chewiest and have a smoky flavor so intense and yummy, your dog will do the happy dance every time you break out the bag! Click to Learn More. Learn How to Give CPR to Dogs! You could Save the Life of a Precious Canine. You will never know when the information that you learn from this video will save the life of a precious canine. ​Learn how to give (CPR) Cardio Pulmonary Resuscitation to your dog. This info can be applied for cats as well. There is one difference so watch til the end. Dental Care is so important for the health of your very best friend. Please do try to do what you can to keep your pets mouth and teeth healthy. Does your dog or cat have dental disease? If your pet is over the age of two, then the answer is “highly likely”. Periodontal disease is the most commonly diagnosed disease in dogs and cats. Veterinary dentists will tell you, 80% of dogs and 70% of cats over the age of two have some form of periodontal disease. That number may seem high, but unfortunately it's accurate. Plaque and tartar accumulate on our pet’s teeth just like it does on our own. However, the vast majority of pet parents don't brush their Pet's teeth twice a day. Or even once a day. By their second birthday, your fur kid is basically fully grown. And far too many of these adults have never had their teeth brushed. "But her teeth look fine!" That might be true. However, plaque (the gummy film that forms on a pet's teeth within hours of eating) isn't obvious to the naked eye. Over the course of several days it combines with minerals to harden into tartar. Over weeks and months, this tartar builds into a thick brown stain. Often referred to as "yuck mouth" or the technical term for it such as periodontal disease. Stage IV is the worst level. With routine care and attention Stage IV is preventable. Evaluating you pet's teeth and gums begins with a visual inspection. Lift the lip up because you really need to do that to view back molars which is where really bad buildup occurs. During the visual exam, your vet will check for tartar, any anomalies (like extra or missing teeth), and for gum inflammation. A vet also checks for any unusual masses. (For example, oral melanomas can be discovered during routine exams). Be sure to check out the Life's Abundance dental-health products: Gourmet Dental Treats, Porky Puffs and Buffalo Bully Sticks! The four stages of a dog’s life are: puppyhood, adolescence, adult and senior. Keep in mind, however, that breeds age at differing rates. When it comes to determining where your dog lands on the scale, size really does matter. For instance, small breeds enter adolescence and reach full size as adults much more quickly than do large breeds. Even so, small breeds enjoy a longer period in the adult life stage. Large and giant breed dogs progress more rapidly to the senior life stage, but overall have shorter lifespans. For example, while the average miniature poodle lives 15 years, a Great Dane’s life expectancy is about nine. When Do Dogs Become Seniors? There is not one specific age at which a pet becomes a senior. In general, veterinarians consider dogs ages 6-7 as having entered their senior years, with larger dogs reaching seniority more quickly than small breed dogs. In human terms, a small or medium-sized breed dog at seven years of age is the equivalent of a mid-forties human, while a large or giant breed dog is more similar to a 50- to 56-year-old. Aging is a complex process that depends on breed, environment and lifestyle, so even within the same breed, some individuals age more quickly than others. Your companion animal’s unique state of health is more important than any date on the calendar! Some of the common medical conditions seen in older pets include heart disease, kidney disease, diabetes, obesity and joint disease. 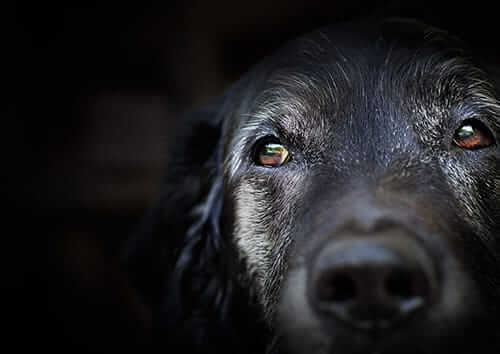 While it’s impossible for diet alone to address all of these conditions, we do know that providing senior dogs with optimal nutrition is the best thing you can do to ensure longevity (more about that in a minute). I ask each of you to work with your veterinarian to come up with a holistic plan to address your senior dog’s individual needs. Nutritional plans for seniors really should feature dietary supplements. For instance, most senior dogs would benefit from taking a premium joint supplement. Remember, aging joints are often painful joints! And it’s not at all uncommon for coats to lose their luster later in life … not to mention, skin becoming dry and flaky. Adding a balanced skin-and-coat supplement just might make all the difference! And, of course, general wellness supplements with antioxidants and immune support could help provide what your senior dog needs for his or her golden years. If you have multiple dogs on different diets and you’re worried about who’s eating what, simplify meal time by feeding in different rooms, or even in crates. For most households, a premium all life stage diet offers the perfect solution. At Life’s Abundance, we’ve worked diligently to perfect formulas that provide abundant nutrition for all breeds, at all points in their life spectrum. The truth is, puppies and senior dogs share many of the same nutritional needs. For instance, our All Life Stage Dog Food features the additional amino acids, probiotics, Vitamin E and zinc that dogs need early AND late in life. With precise portions and individualized wellness supplements, the needs of each individual dog can be met. Now that we’ve covered canines, I’ll be delving into senior cat nutrition next month.